Many of our readers write-in to say that they have trouble getting their kids interested in eating plant-based foods on a regular basis. I don’t have kids of my own, but I can totally sympathize with the challenge. How can we get kids excited about healthy, organic, plant-based foods when they’re surrounded by endless quantities of junk food and advertisements that encourage them to eat them? We recently found a recipe on the Fork and Beans blog that we thought would be perfect for introducing more plant-based foods into your child’s everyday diet. With her inventive smoothie bowls, Cara Ansis hits the nail on the head when it comes to creating food for kids that’s both tasty and fun, while also ensuring that they’re meeting their daily nutritional needs. 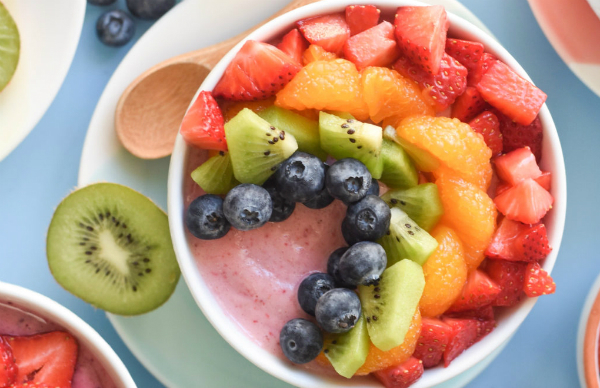 Smoothie bowls are jam-packed with an abundance of fresh fruits and are often accompanied by plant-based yogurt and plant-based milk, which you can either pick up from your local natural foods store or make on your own if you have the right kitchen tools. If you’ve never made a smoothie bowl, this recipe may look a little intimidating. However, being that prep time is only a few minutes from beginning to end, just about everyone will have the time to quickly put one together, even as a last minute snack when the kids are hungry and reaching for something unhealthy. 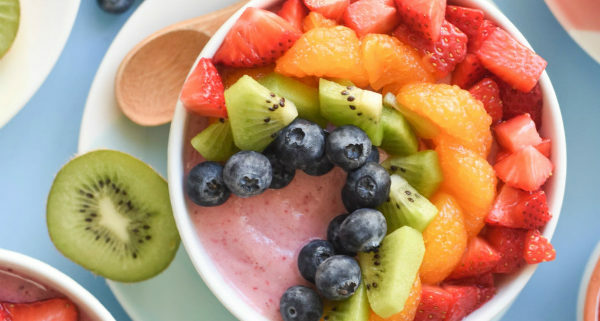 It’s really as simple as blending together a few ingredients, spooning the blended mixture into a couple of bowls, and putting some fresh fruit on top. 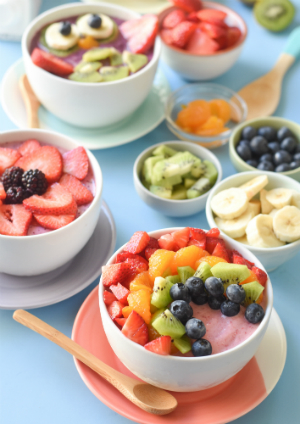 The next time you’re left wondering what to make for your kids who don’t seem to eat anything you make, we hope you’ll give our smoothie bowls a try! They’re delicious enough that you may just want to make one for yourself! Preparation time is 15 minutes and this recipe serves 2. Per Cara’s recipe, you can get super-creative with this recipe and turn your smoothie bowls into creative designs like animals, rainbows, or even flowers! Using fresh fruit, the possibilities are truly endless. Smoothie bowls are safe for kids who have allergies to nuts, soy or grains so long as you choose plant-based dairy products that don’t contain them (there are some great plant-based milks out there that are made from pea protein). 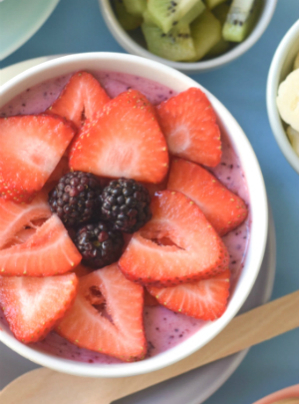 We hope you and your kids will enjoy these awesome smoothie bowls, courtesy of Cara Ansis of Fork and Beans! Click here to see the full recipe on the Fork and Beans blog. As we move into cooler fall temperatures here in Colorado, I start to crave heavier, warmer foods. Even so, I feel at my best if I maintain a certain amount of raw food in my diet. 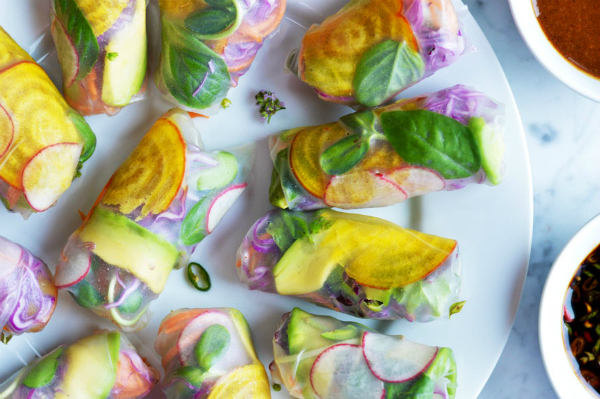 These Raw Rainbow Spring Rolls are a fresh and satisfying summer dish filled with colorful, crunchy vegetables, avocado and herbs that can be enjoyed year-round. 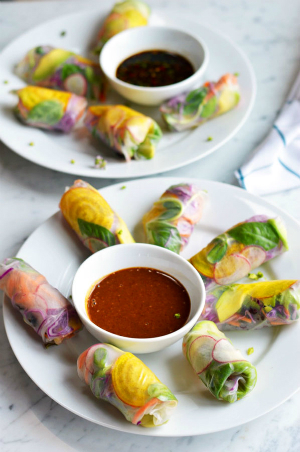 Raw spring rolls are popular in southern Asian cuisine and are typically accompanied by a number of different dipping sauces – one light and one spicy. In this particular recipe, which was shared with us by Ingrid DeHart over at Eat Well, Enjoy Life, there is a rich almond butter sauce and a lighter Asian dipping sauce. Feel free to choose just one or try both when making this recipe. Try using a variety of different vegetables for this dish to let the colorful vegetables shine through. 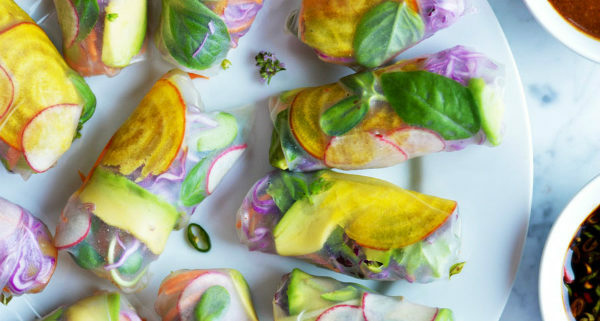 When sliced super thin, the raw yellow beets and red radishes become pliable enough to fold into the roll along with purple cabbage, orange carrots, green sunflowers sprouts and lettuce. You can even add avocado for creaminess and basil for a fresh, herbal flavor. 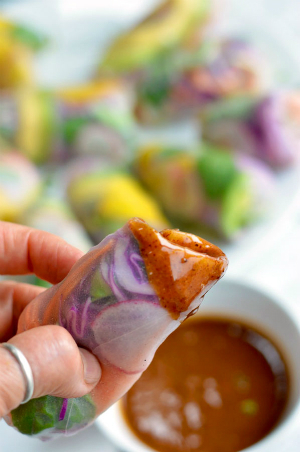 Ingrid’s spring rolls are gluten-free, peanut-free, and free from refined, white sugar. This recipe is a very clear example of an easy-to-prepare raw food dish that can carry you all the way through the winter season due to the heavy, warming nature of the dipping sauces. Give it a try and let us know what you think! Preparation time is estimated at 20 to 30 minutes from beginning to end. This is a great raw food recipe for when you’re short on time and attracts a lot of attention at communal meals due to the bright, varied colors of the rolls. The first one you roll may not be perfect, but once you get the hang of it they come out beautifully. Be sure to spread the vegetables out wide enough so that your spring rolls are about 3 1/2 inches wide after they are rolled up. The rice paper is sticky enough to hold together once rolled. Expert tip: Prepare your sauce first to let the flavors develop while you cut the vegetables. When laying out the vegetables, layer different ones on the bottom to give variety in the final appearance. Serve the rolls with one or both dipping sauces. For the almond and asian dipping sauces, combine all ingredients in two separate medium bowls and whisk until smooth, then transfer to a serving dish. For the vegetable rolls, first prepare the vegetables. Slice the beets and radishes very thin (a mandoline is very helpful here). Julienne the carrots, thinly slice the cabbage, tear the lettuce and thinly slice the avocado. Put all the vegetables into separate bowls. Fill a large shallow bowl with hot water. Soak 1 rice paper wrapper at a time in the water for 20 seconds until just pliable. Spread the wrapper on a work surface. Put some of the beets, cabbage, sprouts, lettuce, avocado and basil in the middle. Fold the sides inward and tightly roll the wrapper up round the filling. Serve with rolls with the dipping sauce. In the midst of a heavy work-week, it may be that all we care about is getting in and out of the kitchen as quickly as possible, living on leftovers and quick fixes. But every now and then, the occasion calls us to create something truly special. Maybe we get tired of preparing the same old dishes everyday, or we read a new blog post that re-kindles our passion for food. The Raw Ombre Cake featured in this post is a fantastic pick for those times. Looking over the instruction set and list of ingredients may feel intimidating at first, but with the right tools, a little know-how, and a desire to eat a bunch of delicious cake…anything is possible. 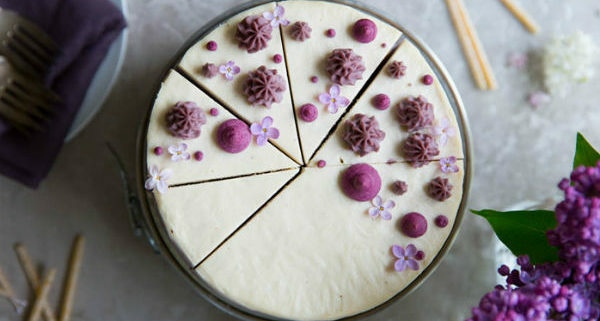 We recently had a chat with Shanna Jade of Kiss My Bowl, and she graciously granted us permission to share her seriously-epic, raw-vegan cheesecake recipe. Although Shanna has recently moved on to other business opportunities, her special talent for creating decadent desserts is evident here. 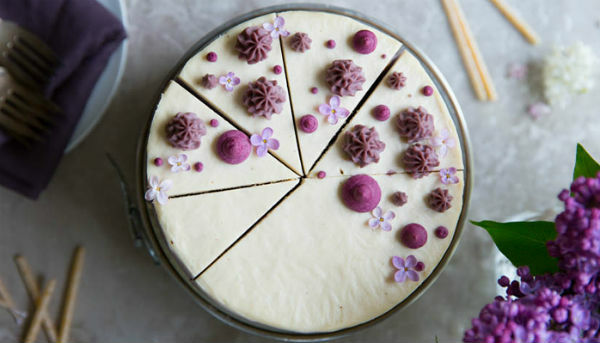 Shanna’s cake is gluten-free, cashew-based, and free from refined sugar. This recipe is a very clear example of plant-based awesomeness that can help to keep us all excited about healthy and compassionate eating. Give it a try and let us know what you think! 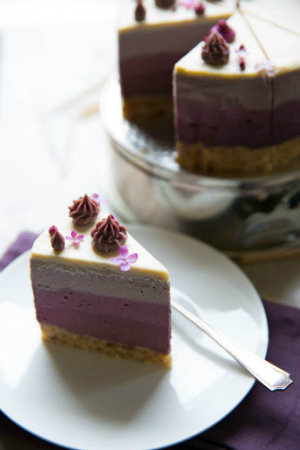 I really hope you enjoy our Raw Ombre Cake, excerpted from Kiss My Bowl and perfect for anyone who wants to demonstrate to themselves that they can create artistic, decadent dishes on the fly. This is a great recipe to show-off to your non-vegan friends and family members. It’s also an awesome choice for communal gatherings and events. I can’t tell you how many times I’ve been to a potluck where the raw-vegan cheesecake totally stole the show. Note that preparation time is likely to be somewhere around 2 hours from beginning to end. For a touch of visual flare, add reserves from the preparation to a piping bag and place in the fridge to harden. Once firm, pipe the designs of your choice onto the cake before setting overnight. For the best results, it’s best to use a high speed blender to pulverize the nuts. This is important to create a smooth, creamy final product. First off prep a 6" spring form cake pan by rubbing solid coconut oil onto the base, then lining the sides with wax paper. Melt the cacao butter or coconut oil for the crust in a heat-proof bowl over warm water. Pour some more warmed water over the dates and allow to soak - this will make them easier to feel for pit fragments (pit if they're unpitted) and to blend. While the dates are soaking, blitz the macadamias in a food processor. You're shooting for a bit of crunch so blitz to a semi fine crumb. Add the dates to the food processor and pulse until the macadamias and the dates begin forming a paste. Add the coconut flour, continue mixing, and then the oil. The crust mixture should be uniform with no bits of dry coconut flour. Press the crust mixture into the bottom of your prepared pan and place in the freezer to set. Add the soaked cashews, can of coconut cream, lemon juice and brown rice syrup to a high speed blender. Blitz, you may need to use the toggle, until smooth and creamy. Add the melted cacao butter and coconut oil. Pour the cashew mixture in equal parts into four bowls. 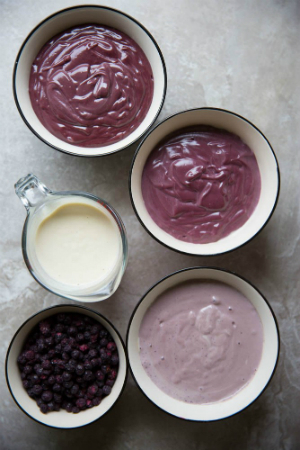 Leave one bowl creamy white, mix 2 tablespoons of blueberry powder into one bowl, 4 tablespoons of blueberry powder into the next, and the last bowl mix in the remaining blueberry powder as well as the acai powder. Remove the crust from the freezer, pouring in all but 2 tablespoons of the the darkest mixture onto the crust. Return to the freezer until just set (about 15-20 minutes). Leave the few extra tablespoons in the bowl for later. Continue the process of layering each color once the one before it has set until you're left with only the creamy white layer. Use the whole bowl, do not reserve any of the creamy white unless you want creamy white stars as decoration. Return the cake to the freezer to set for 10 minutes or so. Remove from the freezer and place the cake in the refrigerator to set over night. Matt could eat hummus and veggies for every meal from now until the end of eternity. In fact, last year we went on a road trip to the Grand Canyon and California and ate hummus for two weeks straight, three times a day. I kid you not. Personally, I like a little more variety. We’ve been especially busy the last few months (we’ve been hard at work creating something special to share with you, details coming in the next few weeks!) and when we’re busy we tend to focus on our go to quick and easy meals. More accurately, we tend to focus on just one of our quick and easy meals then eat it over and over again. In order to branch out, we like to experiment with different mediums and sauces. For instance, we’ll make pasta noodles out of zucchini with a tool called a spiralizer. Combine the noodles with a bomb diggity sauce, and you’ve got a quick, easy and delicious dish that feels new and exciting. 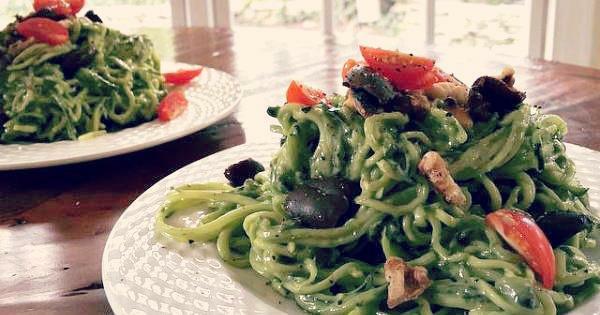 So today we have a veggie pasta recipe to share featuring a light, creamy and delicious avocado basil sauce. It’s the perfect summertime meal when you’re tired of salad and want something more comforting. This sauce would go great on any kind of noodle. We opted for zucchini and kelp noodles. Both were wonderful, especially a combination of the two. Best of all, it’s easy enough that anyone can whip it up in no time flat. Give it a try and let us know what you think! Note: the sauce is a little salty on its own, but the flavor balances out when mixed with the noodles. Additionally, I like to use my hands to mix in the sauce with the noodles. It allows the sauce to spread out more evenly than using a utensil. It’s also much more fun! 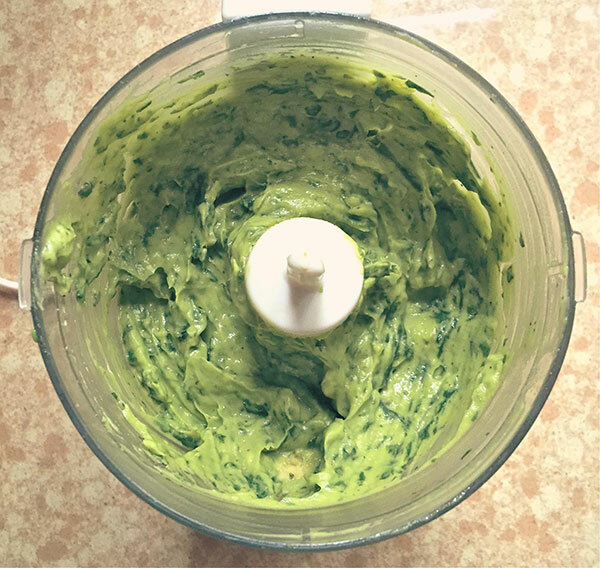 Place basil and garlic into a food processor. 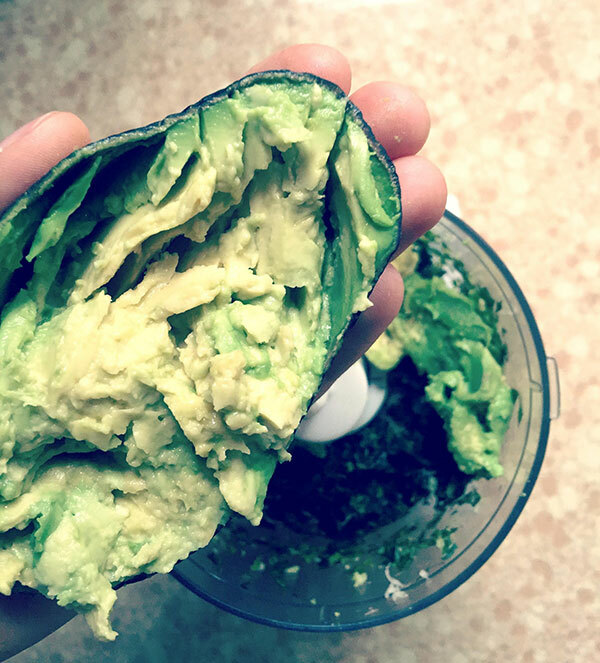 Add avocado, olive oil, lemon zest, salt and pepper to the food processor. If using kelp noodles, remove from package and rinse with cold water. 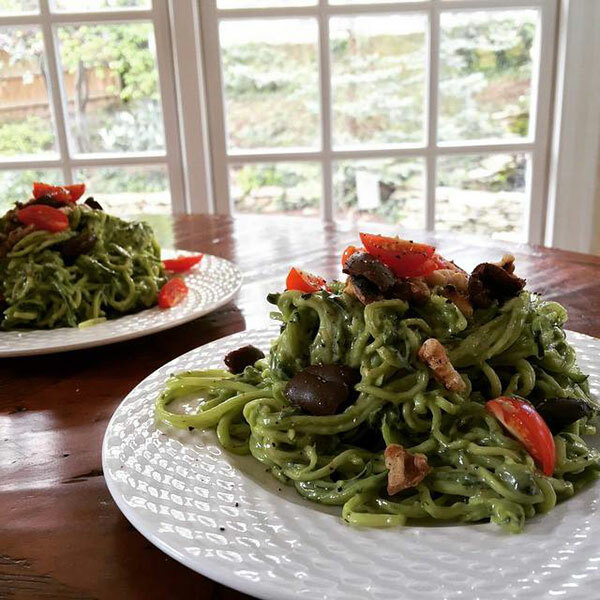 If using zucchini noodles, cut the noodles using a spiralizer and place in a bowl. Place noodles and sauce in a bowl and mix until the noodles are evenly coated. Try mixing with your hands! Add in nuts, tomatoes and olives. 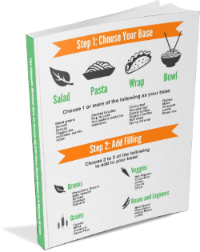 What do you do when it’s time to add a little bit more variety to your meals? Let us know in the comments. We read every single one. Regan is a sought after wellness educator, health coach, and live food chef specializing in Conscious Eating and Spiritual Nutrition.